Ignisphaera aggregans Niederberger et al. 2006 is the type and sole species of genus Ignisphaera. This archaeal species is characterized by a coccoid-shape and is strictly anaerobic, moderately acidophilic, heterotrophic hyperthermophilic and fermentative. The type strain AQ1.S1T was isolated from a near neutral, boiling spring in Kuirau Park, Rotorua, New Zealand. 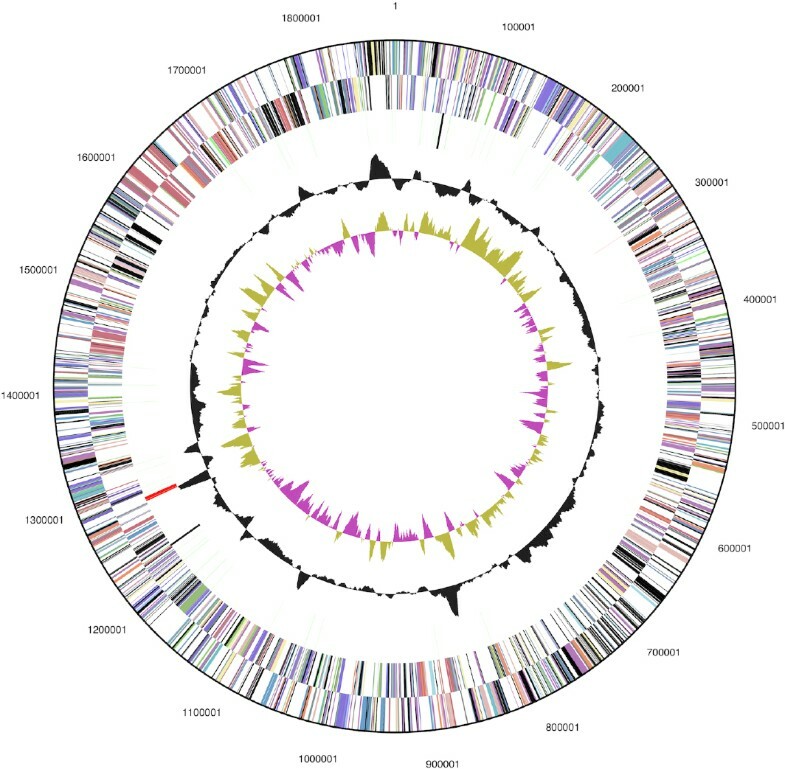 This is the first completed genome sequence of the genus Ignisphaera and the fifth genome (fourth type strain) sequence in the family Desulfurococcaceae. The 1,875,953 bp long genome with its 2,009 protein-coding and 52 RNA genes is a part of the Genomic Encyclopedia of Bacteria and Archaea project. Strain AQ1.S1T (= DSM 17230 = JCM 13409) is the type strain of the species Ignisphaera aggregans, which is the type species of the genus Ignisphaera , one out of nine genera in the family Desulfurococcaceae [2–5]. The generic name derives from the Latin word ‘ignis’ meaning ‘fire’, and ‘sphaera’ meaning ‘ball’, referring to coccoid cells found in the high-temperature environment such as hot springs . The species epithet is derived from the Latin word ‘aggregans’ meaning ‘aggregate forming or aggregating clumping’, referring to the appearance of the cells when grown on mono-, di- or polysaccharides . Strain AQ1.S1T is of particular interest because it is able to ferment quite a number of polysaccharides and complex proteinaceous substrates . Here we present a summary classification and a set of features for I. aggregans AQ1.S1T, together with the description of the complete genomic sequencing and annotation. Strain AQ1.S1T was isolated from a near neutral, boiling spring situated in Kuirau Park, Rotorua, New Zealand . Interestingly, strains of I. aggregans could not be cultivated from pools with similar characteristics in Yellowstone National Park . Only three cultivated strains are reported for the species I. aggregans in addition to AQ1.S1T, these are strains Tok37.S1, Tok10A.S1 and Tok1 . The 16S rRNA sequence of AQ1.S1T is 99% identical to Tok37.S1, 98% to Tok10A.S1 and 98% to Tok1. Sequence similarities between strain AQ1.S1T and members of the family Pyrodictiaceae range from 93.0% for Pyrodictium occultum to 93.4% for P. abyssi  but from 89.7% for Ignicoccus islandicus to 93.5% for Staphylothermus hellenicus  with members of the family Desulfurococcaceae in which I. aggregans is currently classified (Table 1). Genbank  currently contains only three 16S rRNA gene sequences with significantly high identity values to strain AQ1.S1T: clone YNP_BP_A32 (96%, DQ243730) from hot springs of Yellowstone National Park, clone SSW_L4_A01 (95%, EU635921) from mud hot springs, Nevada, USA, and clone DDP-A02 (94%, AB462559) from a Japanese alkaline geothermal pool, which does not necessarily indicate the presence of I. aggregans but probably the presence of yet to be identified other species in the genus Ignisphaera. Environmental samples and metagenomic surveys featured in Genbank contain not a single sequence with >87% sequence identity (as of June 2010), indicating that I. aggregans might play a rather limited and regional role in the environment. The cells of strain AQ1.S1T are regular to irregular cocci which occur singly, in pairs or as aggregates of many cells . They usually have dimensions between 1–1.5 εm (Figure 1). Aggregation of cells is common when AQ1.S1T is grown on mono-, di- or polysaccharides . Strain AQ1.S1T is hyperthermophilic and grows optimally between 92°C and 95°C, the temperature range for growth is 85–98°C. The pH range for growth is 5.4–7.0, with an optimum at pH 6.4. The strain grows in the presence of up to 0.5% NaCl, however, it grows optimally without NaCl. The doubling time is 7.5 h under optimal conditions . I. aggregans strain AQ1.S1T is strictly anaerobic and grows heterotrophically on starch, trypticase peptone, lactose, glucose, konjac glucomannan, mannose, galactose, maltose, glycogen, and β-cyclodextrin. Growth on beef extract and glucose is weak and not observed on yeast extract, cellobiose, methanol, ethanol, trehalose, pyruvate, acetate, malate, casamino acids (0.1% w/v), carboxymethylcellulose, amylopectin (corn), xanthan gum, locust gum (bean), guar gum, dextran, xylan (oat spelts, larch or birch), xylitol, xylose or amylose (corn and potato) . 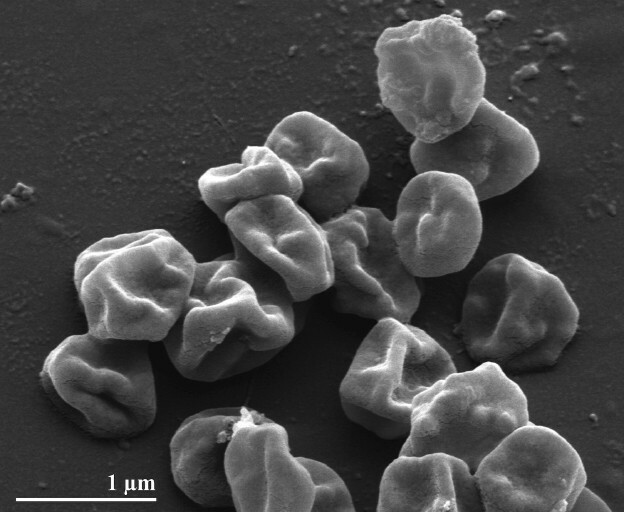 Mono- and disaccharides are accumulated in AQ1.S1T cultures grown in media containing konjac glucomannan, but not in sterile media that had been exposed to the same temperature as the inoculated medium or the stock of konjac glucomannan . As hypothesized by Niederberger et al. , this most probably indicates that the konjac glucomannan is being hydrolyzed enzymatically by AQ1.S1T into sugars for metabolism. Removal of cystine from the growth medium does not affect cell density significantly. Hydrogen sulfide is also detected in AQ1.S1T cultures grown in enrichment media. Strain AQ1.S1T is resistant to novobiocin and streptomycin but sensitive to erythromycin, chloramphenicol and rifampicin . No chemotaxonomic data are currently available for I. aggregans strain AQ1.S1T. Also, chemotaxonomic information for the family Desulfurococcaceae is scarce. What is known is that the type species of this family, Desulfurococcus mucosus, lacks a murein cell wall and contains phytanol and polyisopreonoid dialcohols as major components of the cellular lipids . Figure 2 shows the phylogenetic neighborhood of I. aggregans AQ1.S1T in a 16S rRNA based tree. The sequence of the single 16S rRNA gene copy in the genome of strain AQ1.S1 does not differ from the previously published 16S rRNA sequence from DSM 17230 (DQ060321). Phylogenetic tree highlighting the position of I. aggregans AQ1.S1T relative to the type strains of the other genera within the order Desulfurococcales. The tree was inferred from 1,329 aligned characters [17,18] of the 16S rRNA gene sequence under the maximum likelihood criterion  and rooted with the type strains of the genera of the neighboring order Acidilobales. The branches are scaled in terms of the expected number of substitutions per site. Numbers above branches are support values from 250 bootstrap replicates , if greater than 60%. Lineages with type strain genome sequencing projects registered in GOLD  are shown in blue, published genomes in bold ([22–25], CP000504 and CP000852). I. aggregans AQ1.S1T, DSM 17230, was grown anaerobically in DSMZ medium 1043 (Ignisphaera medium)  at 92°C. DNA was isolated from 0.5–1 g of cell paste using MasterPure Gram Positive DNA Purification Kit (Epicentre MGP04100). One µl lysozyme and five µl mutanolysin and lysostaphine, each, were added to the standard lysis solution for one hour at 37°C followed by 30 min incubation on ice after the MPC-step. The genome consists of a 1,875,953 bp long chromosome with a 35.7% G+C content (Table 3 and Figure 3). Of the 2,061 genes predicted, 2,009 were protein-coding genes, and 52 RNAs; 79 pseudogenes were also identified. The majority of the protein-coding genes (56.2%) were assigned a putative function while the remaining ones were annotated as hypothetical proteins. The distribution of genes into COGs functional categories is presented in Table 4. Even though the tree depicted in Figure 1 is not particularly well resolved, the fact that I. aggregans does not cluster with the Desulfurococcaceae in 16S rRNA gene sequence-based phylogenies calls for a more detailed whole-genome-based analysis . Both, in Figure 1 and in the All-Species-Living-Tree , I. aggregans is located deep on the branch leading to the Thermoproteaceae (and Sulfolobaceae). By circumstance, the class Thermoprotei within the phylum Crenarchaeota already offers a reasonably large set of reference genomes required for such an analysis. We thus assembled a dataset comprising all publicly available genomes from the set of organisms represented in the 16S rRNA tree (Fig. 1). Pairwise distances were calculated using the GBDP algorithm [36,37], which has recently been used to mimic DNA-DNA-hybridization values [37,38]. Here we applied the logarithmic version of formula (3) in [34,38]. The NeighborNet algorithm as implemented in SplitsTree version 4.10  was used to infer a phylogenetic network from the distances, which is shown in Fig. 4. The results indicate that the placement of I. aggregans as sister group of Thermoproteales (Fig. 1) is an artifact of the 16S rRNA analysis. The whole-genome network, while showing some conflicting signal close to the backbone, is in agreement with the splitting of the considered genera into the orders Desulfurococcales and Thermoproteales. However, the analysis provides some evidence that Aeropyrum pernix (Desulfurococcaceae) is more closely related to Pyrodictiaceae (represented by Hyperthermus and Pyrolobus) than to the remaining Desulfurococcaceae. The numerous additional type strain genome sequencing projects in the Desulfurococcales (Fig. 1) are likely to shed even more light on the phylogenetic relationships within this group by enabling future whole-genome phylogenies based on many more taxa. A separate status of I. aggregans within the Desulfurococcaceae is supported by a lack of genes encoding membrane-bound multienzyme complexes that are thought to participate in the energy metabolism of members of this group. Operons encoding a MBX-related ferredoxin-NADPH oxidoreductase and a dehydrogenase-linked MBX complex are lacking in I. aggregans, although both are present in the completed genome sequences of Thermosphaera aggregans , Staphylothermus marinus  and Desulfurococcus kamchatkensis. The genome of A. pernix also lacks genes for the MBH-related energy-coupling hydrogenase, which are found in most members of the Desulfurococcaceae including I. aggregans (Igag_1902 - Igag_1914). Phylogenetic network inferred from whole-genome (GBDP) distances, showing the relationships between Desulfurococcaceae (Aeropyrum, Ignisphaera, Staphylothermus and Thermosphaera), Pyrodictiaceae (Hyperthermus and Pyrolobus), Thermoproteaceae (Caldivirga, Pyrobaculum, Thermoproteus and Vulcanisaeta) and Thermofilaceae (Thermofilum). We would like to gratefully acknowledge the help of Maren Schröder (DSMZ) for growth of I. aggregans and the help of Alexander Auch (Tübingen, Germany) in creating a local version of the GBDP software. This work was performed under the auspices of the US Department of Energy Office of Science, Biological and Environmental Research Program, and by the University of California, Lawrence Berkeley National Laboratory under contract No. DE-AC02-05CH11231, Lawrence Livermore National Laboratory under Contract No. DE-AC52-07NA27344, and Los Alamos National Laboratory under contract No. DE-AC02-06NA25396, UT-Battelle and Oak Ridge National Laboratory under contract DE-AC05-00OR22725, as well as German Research Foundation (DFG) INST 599/1-2 and SI 1352/1-2 and Thailand Research Fund Royal Golden Jubilee Ph.D. Program No. PHD/0019/2548 for MY.